Patients who undergo plastic surgery can look forward to gaining self-confidence and a sense of well being from looking, feeling and functioning at their best. For those who wish to enhance their appearance, today's cosmetic surgical procedures offer patients the opportunity to reshape physical features and improve their self-esteem. At ACI, our focus is the complete satisfaction of all of our patients. Every effort is made to ensure that our patients make well-informed choices and achieve the best results possible, all within a personal and confidential setting. Dr. Albright comes to us from Penn State Milton S. Hershey Medical Center, where he completed a six-year plastic surgery residency. He received his medical degree with highest honors from the University of Texas Medical Branch in Galveston, and a Bachelor of Science degree with honors in Microbiology from the University of Texas in Austin. In 2015, Dr. Albright completed an externship in aesthetic surgery in São Paulo, Brazil where he learned advanced techniques in rhinoplasty and cosmetic breast surgery. Dr. Albright brings extensive experience to our patients in cosmetic surgery of the face, breast, and body; reconstructive surgery after skin cancer and breast cancer; and trunk and extremity reconstruction such as hand surgery and abdominal wall reconstruction. When he is not in the office or in surgery, Dr. Albright enjoys reading, competing in CrossFit, and spending time with his family. Dr. Albright, his wife Juli, and their two children are proud to call Cedar Rapids home. "'We restore, rebuild, and make whole those parts which nature hath given, but which fortune has taken away. Not so much that it may delight the eye, but that it might buoy up the spirit, and help the mind of the afflicted.' -Gaspare Tagliacozzi, one of the fathers of plastic surgery." Dr. Grado has retired from the practice after more than 30 years of providing plastic surgery services in Cedar Rapids and surrounding eastern Iowa communities. Dr. William Albright and Dr. Patrick Hawkes will continue to provide the same quality care and exceptional outcomes patients have come to expect from UI Health Care/Aesthetic Consultants of Iowa. As noted in Dr. Albright and Dr. Hawkes’s bios, they bring extensive experience to patients in cosmetic surgery of the face, breast, and body; reconstructive surgery after skin cancer and breast cancer; and trunk and extremity reconstruction such as hand surgery and abdominal wall reconstruction. Congratulations and best wishes are extended to Dr. Grado as he begins his retirement. I have struggled with my breast size from the time I began puberty. I have memories of being embarrassed in dance class, self-conscious at the swimming pool, frustrated while shopping, and generally unhappy with how I felt in my body. As I grew older, the physical aspects of large breasts became more prevalent. After my third child was born and I knew I was done breastfeeding, I began to actively research breast reduction. In January of 2017, I was referred to Dr. Albright. My surgery was scheduled for early February, and I am currently four months out and at the risk of sounding melodramatic, I am an entirely new person. Dr. Albright and his staff were kind, supportive, accommodating, and tremendously helpful and informative. I couldn't be happier. My only regret is that I didn't do this earlier. Without question, it is the best decision I have ever made for myself, and I feel incredibly lucky to have been under the care of such a skilled doctor. Dr. Albright, you and your WONDERFUL staff helped me achieve something I've wanted to do since I was a teenager. I came in scared, nervous, and skeptical and after my final follow up appointment I left feeling more confident than I have in a long time. I have never met a doctor with such great bedside manner, care, and compassion. You love what you do, and it shows. You have a way of explaining each and every step so that it makes sense and make your patients feel comfortable enough to ask all the important questions. While I may not have recovered as quickly as most of your patients do, once I did - I was thrilled with my results - and still am! I just want you to know that I appreciate everything you have done for me since the very first time I came into your office, and the care and concern you and your staff have always shown. I will always highly recommend you! I met Dr. William Albright for a consultation about having a breast reduction. During my consultation he reviewed everything I needed to know and what to expect before, during, and after the procedure. Dr Albright has a great bedside manner and truly cares for all his patients. Having a breast reduction was the greatest decision I ever made, and I couldn't be happier that I went with Dr. Albright to have this done. I would recommend Dr. Albright for all plastic surgery needs!!! I cannot say enough good things about Dr. Albright and his staff; very professional every step of the way. He is very kind and caring, very knowledgeable and respectful of his patients. He explained things to ensure I understood the procedure, what to expect, and he put me at ease when I asked questions. I was able to put my trust in Dr. Albright and his staff and I am very pleased with my outcome!!! Thank you so much for allowing this surgery to be possible and making it an easy/smooth transition. I appreciate all your hard work, knowledge, and skill more than you know! This surgery has been something I've wanted for over a decade. My life has already changed! My back already feels better and it's amazing how much better clothes fit! I'm already able to function as a normal human being! I look forward to being able to do normal daily tasks without pain and be able to interact with my children without pain and discomfort. I also look forward to the ability to exercise and just being able to sit up and stand without having pain - it's already been a vast improvement! Thank you for changing my life more than you can phathom. I really appreciate all you have done for me! Thank you! I want you to know that you and your staff have made having this surgery one of the most positive experiences I have ever had. Right from the initial visit, everyone has been so friendly and made me feel so comfortable, beyond anything I could have imagined. And the staff at the hospital was just awesome, they made me feel so at ease, treated me so good. No one made me feel that what I was having done was anything but perfectly normal and right. It has been a year now since my surgery and I do not have one regret or complaint, recovery was remarkably fast and uneventful and my results are absolutely what I wanted. I know that you and your staff made this experience what is has been, you for the way you treated me, and the surgery you did and your staff for always being there with a smile and answers for my questions, some before I even asked. I so appreciate what you all have done. Thank you all! I wanted to let you all know how happy I am with the results of my breast reduction. Having the Breast Reduction was by far the BEST thing I‘ve ever done for myself. I am so grateful for such a wonderful plastic surgeon and wonderful staff members!! The Surgery Center Staff were great too. I could not be happier. Not only do I feel better physically (no more neck, back, shoulder pain or headaches) but I feel absolutely wonderful emotionally. The only regret I have is not getting this done years ago. At 34 years old I feel like a teenager again! Than you all so much --- I cannot thank you enough. You made my dream come true and I’m forever grateful to you. My thighs were always much larger than the other girls and not in proportion with my upper body, which is fairly small. I have never been comfortable wearing shorts or shorter dresses because of my thighs. I had heard about one possible procedure and talked with my doctor, but was told that procedure was not for me and that instead I needed a ‘circumferential thigh reduction.' I decided to get a second opinion from Dr. Charles Grado at University of Iowa Hospitals and Clinics, as he had done another procedure in 2005. When I learned he was retiring, I was set up with Dr. William Albright, and after an extensive consultation I decided to go forward with him! Dr. Albright was very upfront that this was not going to be done for weight loss but for body contouring and stressed that he wanted me to have realistic expectations, which was what I was looking for – I don't want super thin legs with my frame. I scheduled my procedure for January 2017. Less than five weeks from my surgery I am already SO satisfied with my results! They look like the legs I've always wanted but could never achieve, even with diet and exercise. It will take six to eight months to see the full results but I am satisfied so far! I have been wearing my compression garment and socks 24/7 since the procedure and will until the six-week mark, and will continue to do so during the day until eight weeks. I look forward to my final results and would recommend Dr. Albright to anyone considering this procedure! It was a difficult decision to have cosmetic surgery for many reasons. I was unsure and I was very nervous about the procedure and the recovery. I quickly felt comfortable with Dr. William Albright and his team. Even on the day of surgery he was calm and reassuring. I have never regretted my decision and am extremely happy with the results. Everyone in the office has been helpful and kind. My questions are always addressed in a timely and professional manner, and I have felt at ease every time I enter the office. I would highly recommend Dr. Albright and his staff. I had been looking into having a breast augmentation for quite some time. I did some research online and found the University of Iowa / Aesthetic Consultants of Iowa. I have always heard great things about the U of I and have had a great experience with family members coming to the U of I. I felt that this was going to be a great choice. I scheduled my appointment with Dr. Albright. Coming into my first appointment, the staff was extremely nice and very welcoming. They made me feel comfortable. After meeting with Dr. Albright, I knew that he would be the one I chose to do my augmentation. He was very honest, answered my questions, and he helped me choose the right options for me. He told me to take all the information I had gathered and wanted me to make sure this was the right choice for me. I was able to see my results the following day and was excited to see them! My breast augmentation turned out great and I was very impressed with Dr. Albright's work. He has explained what I should expect with my results. I felt the price was very fair and it was worth the result! I would recommend Dr. Albright and his staff to anyone looking into cosmetic or reconstructive surgery. They have been more than amazing! If anyone were to ask me where to go or who to see about breast reduction surgery, I would recommend Dr. William Albright at University of Iowa Hospitals and Clinics every time. I was pretty shy discussing my discomfort at my first consultation – large breasts were something that I had lived with for a very long time and I had many questions about the surgery. But Dr. Albright and his team helped me warm up to the idea, talking to me about the procedure, risks, overwhelming benefits, and recovery. I remember telling him, "I don't care what the scars look like I just want to be able to exercise and sit comfortably without these aches and pains." I'll never forget his response: "Leave the scars to me – you'll do great in there." I honestly thought I would cry after seeing my breasts for the first time after surgery, but I didn’t. I smiled. Now I feel more confident, my posture has improved, and I have finally realized what an overwhelming weight had literally been lifted off of my body. To say I am grateful for Dr. Albright and his team is an understatement. I would describe each one of the people in his office as friendly, warm welcoming, and people who genuinely care about your comfort/discomfort. Thank you, University of Iowa Health Care / Aesthetic Consultants of Iowa. Aesthetic Consultants of Iowa is a practice that reaches beyond the Cedar Rapids area as many of our patients come to us from all over Iowa, Illinois, Wisconsin, Nebraska, Missouri and Minnesota. That is why Aesthetic Consultants of Iowa offers travel assistance to all our patients coming to the Cedar Rapids area. We understand that even minor surgery can be stressful, so we make every effort to provide a calm and relaxing experience so that you can concentrate on your health and well-being. We will help arrange lodging at your choice of several local hotels, each offering superior amenities, nearby dining, and a short trip to our office. Someone must accompany you and stay with you in the hotel. These hotels will off you a discount when you mention that you are a patient of University of Iowa Health Care / Aesthetic Consultants of Iowa. We have developed our operating schedule to revolve around our patients’ needs and offer patients the ability to come into town, have surgery, and head home in as short a time as possible, without compromising safety. Please call our office and ask our staff any questions you may have about our travel services. The registration forms can be viewed and printed. Viewing and printing require Acrobat Reader, a free download from Adobe Systems. Click on the link if you do not already have Acrobat Reader. Practice Stability: Please consider how long the surgeon has been in their practice setting. Your follow-up care may extend over weeks, months, and years. A surgeon who has not been in one place in practice for any significant length of time may not be able to provide you with your continued care. Office staff: You should carefully note how you are treated when you call for information. Do the staff people just want your name/address and to get you off the phone? Do they take the time to talk with you about your needs and questions? Do you feel that you are an inconvenience? These people should be helpful and courteous to you. We strive to always remember that you, the patient, are our employer. Office: You should expect a facility dedicated to your care and not to be seen in a multi-doctor office. Only a facility designed with your care in mind will be set up to provide you with the care and confidentiality you expect and deserve. Our facility is modern and was designed by Dr. Grado. You will not be running into all sorts of people going to see other doctors in the building when you come to Aesthetic Consultations of Iowa. Check Facility Accreditation: Cosmetic surgery can safely be performed in a hospital, a surgical center or an office-based surgical facility: Current published data show that accredited office-based facilities have a safety record comparable to that of hospital ambulatory surgery settings. However, the majority of office-based surgical facilities are not accredited. Another advantage of selecting an ASPS member surgeon is that they operate in accredited, state-licensed or Medicare-certified facilities. For your safety, ask about facility accreditation. Dr. Albright only operates in accredited facilities. Check Hospital Privileges: Before granting operating privileges, hospital review committees evaluate a surgeon's training and competency for specific procedures. Wherever the surgery will be performed, be sure that the surgeon has operating privileges in an accredited hospital for the same procedure being considered. Check Reliable Sources: Asking your primary care doctor for recommendations is a good place to start, and friends may offer suggestions. Often these people have had close contact with the surgeon you are considering and can provide you with an accurate description of their experience. Check Thoroughness: The consultation is an important opportunity for questions to be asked and answered. It should include a candid discussion of risks as well as benefits of the surgery. At Aesthetic Consultants of Iowa, our surgeons personally discuss the operation as well as what specifics are important to know. A thorough consultation also involves a review of medical history including any existing medical conditions. All these factors help the surgeon to custom-tailor the operation to best meet the needs of each patient. Learning from a video or an assistant and not the surgeon is a sign of the care you can expect afterwards. Check Rapport: Even the most experienced surgeon is not the “right” surgeon for every patient. Any successful relationship depends on good communication. Patient satisfaction is enhanced when surgeon and patient candidly discuss goals, agree on realistic expectations, and plan the course of the surgical journey together. If you do not like your surgeon or feel comfortable, find another surgeon. Check Experience: Experienced aesthetic plastic surgeons generally perform a wide range of cosmetic surgeries on a regular basis. Patients should ask about the surgeon's experience with the particular procedure being considered. If considering a “new” technique or technology, patients should inquire whether results substantiating safety and effectiveness have been published in a peer-reviewed journal. Aesthetic Consultants of Iowa has been in practice here in Cedar Rapids since July 1985. Check Follow-up Care: Good surgical care does not end with the surgery. Patients should inquire about follow-up visits and about the doctor's policies should surgical revisions be necessary. Your follow-up visits after a cosmetic surgery are included for a year at Aesthetic Consultations of Iowa. Check Cost: You have the right to expect fairly accurate estimates for your care during your procedure. You should expect cost estimates for anesthesia, surgery, implants, and facility fees. Elusive or vague estimates should not be accepted. Patients should note that cosmetic surgery usually is not covered by insurance. At Aesthetic Consultants of Iowa, we will do our best to provide you with accurate cost estimates. Unlike many physician offices, the office of Aesthetic Consultants of Iowa is a dedicated facility entirely for the use of Dr. Albright in seeing and caring for his patients. In 1991 Dr. Grado designed and had built a premiere facility in a beautiful wooded space. The office embraces the surrounding woods and the wildlife there. The reception area is wrapped in floor to ceiling windows along the entire length looking into a serene natural setting. Expect to see all sorts of wildlife from wild turkeys, songbirds, deer, and many other creatures. You will not have to worry about running into a friend or acquaintance seeing another doctor as occurs all too often in a multi-physician clinic or office building. 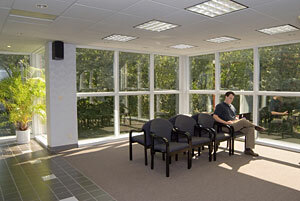 This office is designed with privacy and confidentiality that you should expect with your care. Take Highway 20 to Northwest Arterial, turn North to Associates Drive, take a right on Associates Drive. If you go South NW Arterial, you will go into the Wal-Mart parking lot. Dr. Albright will be seeing patients in the OB-GYN Dept. on second floor. Stop at registration desk just off the elevator.